Chanel created extravagant evening wear such as this sequinned dress and cape. The combination of glistening black sequins and scarlet satin panels is very dramatic. The rows of overlapping 'fish-scale' sequins emphasise the supple, falling lines of the outfit. The short, semi-circular cape has a scarlet satin lining. 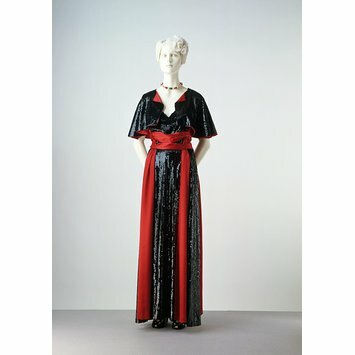 Mrs Leo d'Erlanger wore this ensemble, which forms part of the Cecil Beaton Collection. Sir Cecil Beaton was a society photographer. With great energy and determination Beaton contacted the well-dressed élite of Europe and North America to help create this monument to the art of dress. The Collection was exhibited in 1971, accompanied by a catalogue that detailed its enormous range. Full length evening dress and cape of black net entirely covered with overlapping black sequins, and with a crimson satin double waistband and gores inset into the skirt. 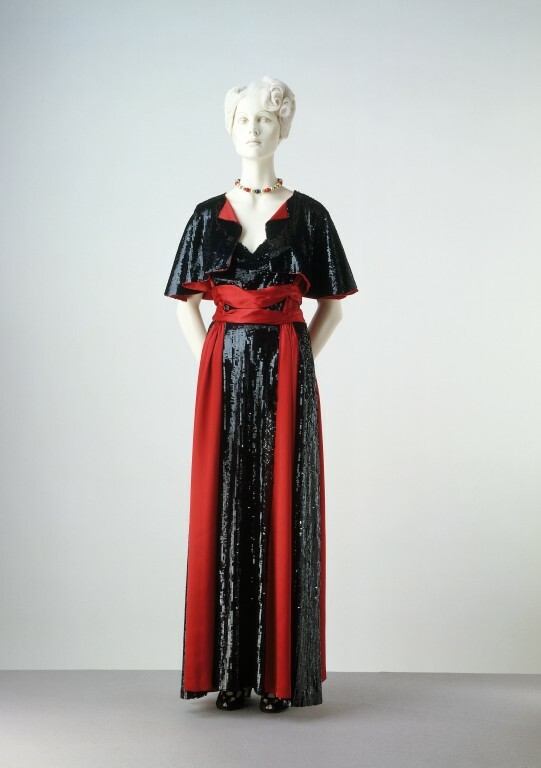 With a short and semi-circular shoulder cape of crimson silk satin with the outside entirely covered in overlapping black sequins as with the dress. Dress with a sleeveless bodice and decolleté with straps. Side gusset of red scarlet. Side hook fastening attached to the bodice, and at the waist is a boned foundation panel. The cape is lined with red satin. Round neck and hook fastening.